The small town of Pickering is known for its beautiful waterfront views and idyllic nature trails. With just over 80,000 residents, Pickering has many residents who rely on their cars to commute to jobs both inside and outside the city. Many recreational and cultural sights rest just outside the city in busy nearby Vaughan, giving residents even more reason to drive. With so much relying on the use of vehicles, Car Detailing Shop knows how important it is to maintain your car inside and out. This is why we are committed to providing the most convenient and affordable mobile car detailing in Pickering. With a wide range of service packages and a 100% mobile unit complete with electricity and water, Car Detailing Shop is making it easier than ever to get and keep your car running perfectly! To book your mobile Pickering car detailing, call us at 647-920-5199! Satisfaction Guarantee: At Car Detailing Shop, we don’t just want you as a one-time customer, we want to create a lifelong partnership. To ensure you think of us first for all your car detailing needs we offer a 100% satisfaction guarantee. Environmentally Friendly Steam Cleaning: Wash Me is committed to the health of customers and the environment. This is why we use only water-saving steam for interior cleaning. Naturally antimicrobial, steam gets fabrics clean without harsh chemicals that can pollute water and the air inside your car. 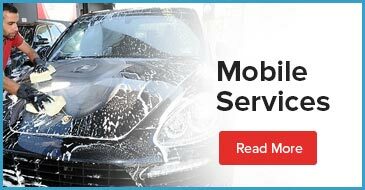 100% Mobile Car Detailing: When we say 100% mobile, we mean it! Our mobile units come equipped with both water and electricity, so we can service your vehicle anytime, and anywhere you need it. Affordable Package Deals: We offer a wide range of packages to meet your needs, including both interior and exterior only packages along with showroom and like-new packages for the ultimate detailing experience. Find the right package for your car, here. Car Detailing Shop makes it easy to fit in car detailing in Pickering. When you schedule with us, just let us know the type of vehicle and which package you would like, and we’ll give you an accurate time estimate for how long service will take. To book your mobile car detailing, contact Car Detailing Shop today at 647-920-5199!